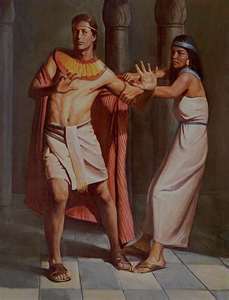 Potiphar’s wife was attracted to Joseph. After her husband had gone abroad she made her feelings known to him. ‘Come and lie with me,’ she said. ‘How could I do this great wickedness and sin against God?’ he said. Day after day she kept asking him to lie with her but Joseph refused. This was a cruel lie for she, not Joseph, wanted to lie with him. Lies cause trouble for innocent people. To lie is to speak falsely. She knew that Joseph would be punished severely when she told her husband. When Potiphar returned home he found his household very disturbed, His wife repeated her lies to her husband. ‘This is the way your servant treated me,’ she said. God knew the truth for God who made the ear can hear everything and God, who made the eye can see everything that we do. So He knew that Joseph was innocent. He know our hearts and our actions. This is not the end of our story. Next we shall learn how Joseph behaved in prison. Joseph remembered his dreams. These were a comfort to him for in his dreams God made him a person of high regard and trust.